It would seem that audio components are inanimate objects, dead by definition. We, audiophiles, naturally anthropomorphize them giving them human traits for we are attached to them both emotionally and – well – financially. However, that doesn’t change what I just wrote: components are dead. Period. Yet it’s also true that despite their objective deadness some components set off a reaction in US which makes them less dead; they become a little more “alive”. Then we do something that we wouldn’t think to do with another product and even if we did it would be rather figured out than “received”. That was exactly what happened with a tiny thing that one day arrived at my house from Italy. LYM 1.0T PHONO integrated amplifier to which I refer manufactured by Italian Lysis-May SRL is more or less half the size of a school notebook. One can put an XRCD disc on it and although the map will slightly sticking out on one end the other end will be conceal deep in the shadow. 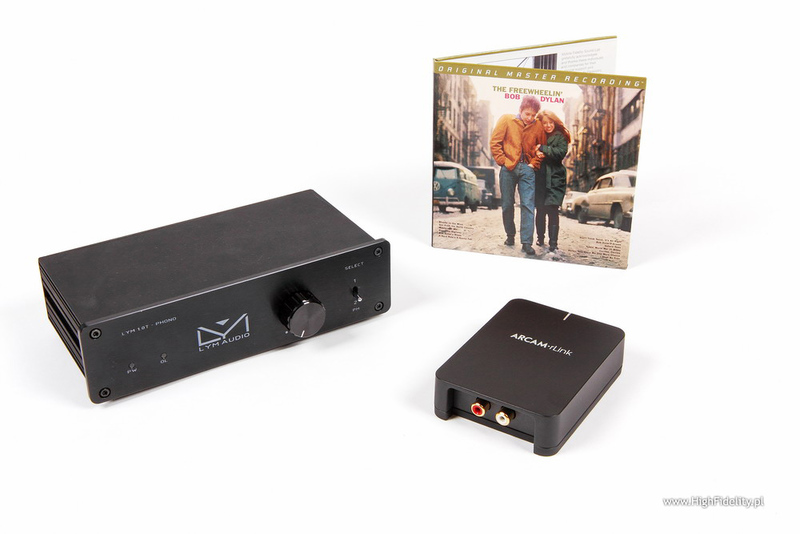 Still, however, we deal with an integrated amplifier additionally equipped with a phono stage! As one can easily guess the baby must operate in class D to work at all without overheating and to deliver – as declared by the manufacturer – 2 x 17 W into 4 Ω and 2 x 10 W into 8 Ω.
Amplifiers working in that class are based on one of a few of modules from well-known manufacturers. This time it is no different. The Lym 1.0T is built on TA2024C from Tripath, the author of a patent for “Class T” being a variant of class D. The amplifier is one of the two models currently offered by LYM, or to be more precise one of the two versions of the same model. I hope you are enjoy listening music come out from our little amp. 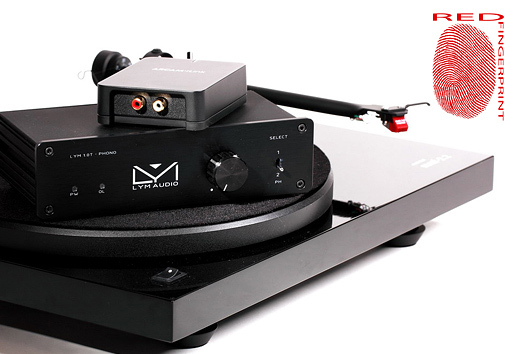 I write to inform you that the updates made on the model (LYM 1.0T PHONO new coils, new response curves, more power) are available just for this model. Anyway customers will be able to request these updates for the LINE version at a cost of 30 euros (ampli 230 + power supply 30 + upgrades 30= 290). Thanks again for your precious time you give us. And it was the amp that inspired me to something we don’t often do but that was self-evident at that moment, as if the LYM 1.0T PHONO set off something in me, as if it said something to me… I received a clear impulse: to set up an audio system around the amplifier. I had two inputs at my disposal, a line input and a MM phono input. You may or may not believe me but nearly at the same moment came to my mind both accompanying components I had no doubts would sound perfect with the LYM. First of them was the rLINK converter, a completely new model from Arcam. I knew it would be OK as I’d recently reviewed for “Audio” its little brother from the same “litter”, so to speak, the rPACK converter with USB input. The rLINK has two S/PDIF digital inputs – TOSLINK and RCA. Both accept signal up to 24-bit 192 kHz. The unit is housed in a small, very solid and simply lovely die-cast aluminum enclosure. There’s only one LED on the top panel, lighting in different colors to indicate the status of the device. The DAC is powered by a walwart power supply. The choice of turntable was also immediately clear to me although in this case I took advantage of the fact that it was almost next door at Eter Audio, Music Hall’s distributor. That’s where I fetched the Music Hall mmf-2.2 from, equipped with a Tracker cartridge custom manufactured by Goldring for Roy Hall. 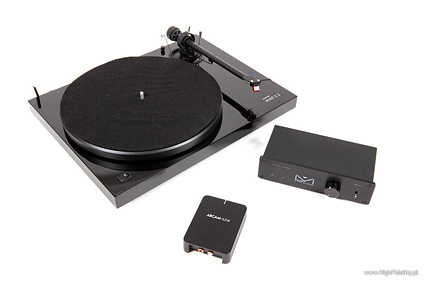 I already knew the turntable as I’d reviewed it for "Audio". I plugged the DAC into the line input and the turntable into the phono input. I deliberately did not choose speakers for that system. That’s a part entirely dependent on customer’s room size, music taste, aesthetics, etc. At the end of the review, however, I will give a few clues that are worth noting. The components played only with each other, I compared them as a whole (system) against my reference system in which the DAC equivalent was Ancient Audio Lektor Air V-edition CD player, the amp equivalent was the combination of the Ayon Audio Polaris III [Custom Version] preamplifier and the Soulution 710 power amplifier while the turntable equivalent was the Xtension 10 turntable from Pro-Ject I was just reviewing for “Audio”. The DAC was coupled to a number of sources. First of all to the Philips CD-Pro2 LF drive in the Ancient but also to the Blu-ray drive in Cambridge Audio Azur 751BD (see HERE). The Cambridge player also worked as media player, fed via Ethernet from a small Synology NAS and from flash memory sticks. I used speaker cables and analog interconnects from Acoustic Revive (solid core) and a new digital cable from Ear Stream. Sting, Sacred Love, A&M Records, 9860618, Limited Edition, SACD/CD (2003). Sting, Songs From The Labyrinth, Deutsche Grammophon, 170 3139, CD (2006). Sting, The dream of the blue turtles, A&M Records/Mobile Fidelity, UDCD 528, gold-CD (1985/1990). Thom Yorke, The Eraser, XL/Warner Music Japan, WPCB-100001, CD (2006/2007). Dead Can Dance, Anastasis, [PIAS] Entertainment Group, PIASR311CDX, Special Edition Hardbound Box Set, USB drive 24/44,1 WAV (2012). AC/DC, If You Want A Blood, Atlantic, ATL 50 532, LP (1978). Brendan Perry, Ark, Cooking Vinyl/Vinyl 180, VIN180LP040, 2 x 180 g LP (2011). Budka Suflera, Cień wielkiej góry, Live 2011 + studio 1975 (box), Polskie Nagrania Muza/Budka Suflera Productions, BSP 05-2011, 2 x 180 g LP + 2 x CD; review HERE. Komeda Quintet, Astigmatic, Polskie Nagrania Muza/Polskie Nagrania, XL 0298, "Polish Jazz Vol. 5", LP (1966/2007). Kraftwerk, Autobahn, King Klang Produkt/EMI, STUMM 303, Digital Master, 180 g LP (1974/2009); review HERE. Mel Tormé, Oh, You Beautiful Doll, The Trumpets of Jericho, Silver Line, 904333-980, 180 g LP (2000). The amplifier is amazing in every way. The fact that it’s small and inexpensive is but a surprise we get quickly used to. The real revelation is its sound. If I hadn’t seen what I saw nor had I known what I knew I’d think I was listening to a not particularly powerful yet quite expensive tube amp. It was only when I heard the amp go into clipping different for solid state than tube that showed me the employed technology. Still, however, trying to guess the price would be much harder. The amplifier presents us with full, large sound with excellent dynamics. That’s not some chirp-chirp but well-developed, muscular presentation with excellent bass foundation. Knowing LYM’s power output and price level its low extension is simply shocking. It was not deterred by nearly infrasonic drums from the new Dead Can Dance album Anastasis or low electronic rumble from Jean-Michel Jarre and Vangelis. The former album is very little compressed and the drum beat on track no. 2 regularly overloaded the amplifier, indicated by a flashing orange LED on the faceplate. However, since we are not too sensitive to low-frequency distortion and because that just happens to be the frequency band in which even the best speakers show greatest distortion that didn’t really bother me. The sound was very low, powerful and yet very – as I said, a result of psychoacoustics – clean. Albums by Jarre (Magnetic Fields) and Vangelis (Spiral) were much easier since here bass is shallower and more compressed. Hence, it was possible to play them louder. 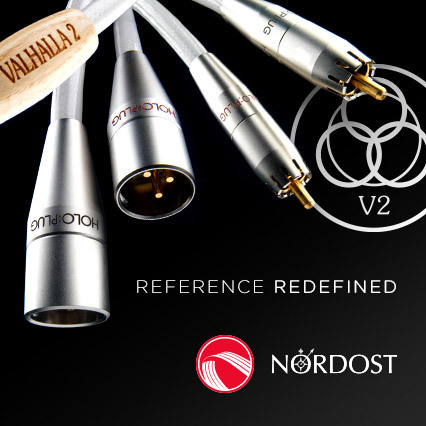 All three albums proved it to be effortless presentation, without compression, which is amazing for an amplifier with such comparatively low nominal power and virtually no overload margin. The other frequency extreme was basically a mirror of the low end – treble was well extended, clean and simply attractive. Amplifiers operating in class D almost always – with a few exceptions – tend to have rather limited bandwidth. That’s the result of the employed technology and an interaction of the output stage and speaker cables forming a part of the low-pass reconstruction filter at the output. Here that limitation has somehow been minimized. I’m not saying it’s been fully eliminated but it was not particularly audible. Only on recordings with higher sampling rates than the CD, like 96 and 192 kHz, it could be perceived as a slight closing of the spectrum, somewhat less defined acoustics and less air. But even they sounded very good and the CD sounded perfect. But there is more. While bass will surprise us and treble will leave us in amazement, we’re in for a real shock listening to what’s going on in midrange department. You may have already guessed that presentation is deep and powerful and that vocals have great texture. Sure they do. Another revelation in addition to bass and treble extension, however, is an uncanny ability to differentiate midrange. Even though I first mentioned electronic music, most of my listening tests – what I started and ended with – involved vocals-centered music, whether jazz, rock or classical. With every next album I was surprised how well it all fit together, how well it was united. There was no urge to analyze anything as I wasn’t annoyed by excessive details, “something this or that” didn’t suddenly jump out at me and instead I got coherent, consistent presentation. Key to all that, however, was differentiation. The converter and the amplifier showed great differences between recordings. That The Eraser is highly compressed and not very clean, and that Anastasis by DCD has been recorded with fantastic energy, and that the 1997 remaster of Magnetic Fields is quite warm and limited on top and bottom, or that the tracks collected on Carol Sloane’s Little Girl Blue are radically different from each other, etc. All of that was naturally and simply audible.